On the weekend I visited Hobby HQ again, the excellent model shop in the northern suburbs of Melbourne which is soon closing down (I’ve mentioned it on my previous visit here). I caught up there with my friend Ian and his mate Dave - you can never have too many Daves at any social event. 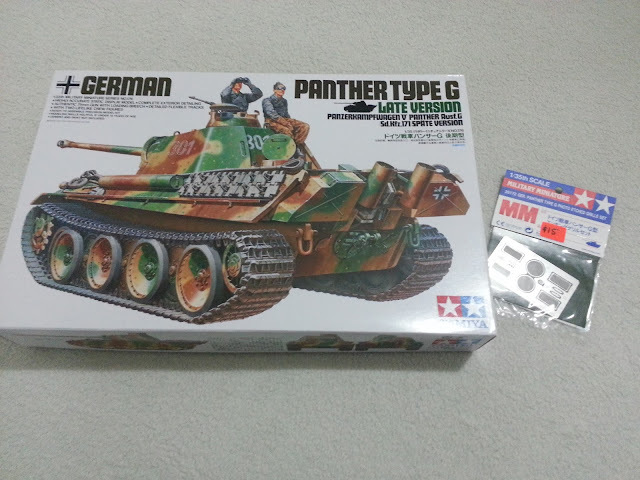 The good news is that I finally purchased a 1/35 Panther tank kit! 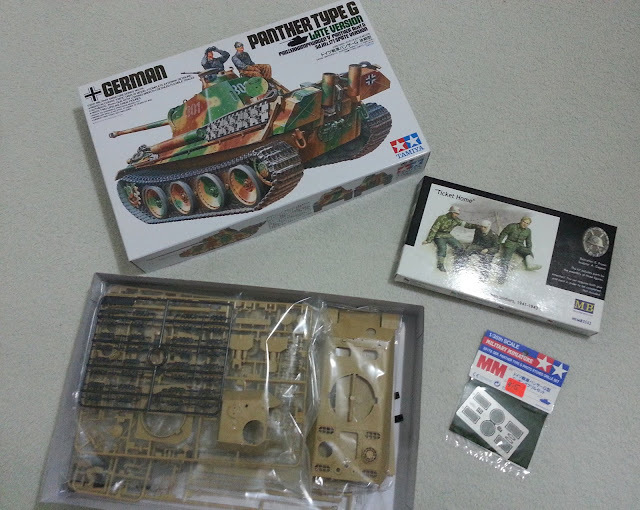 I have been wanting to build a Panther for ages, and it was on my 2016 Christmas model wish list. I did a bit of research beforehand. 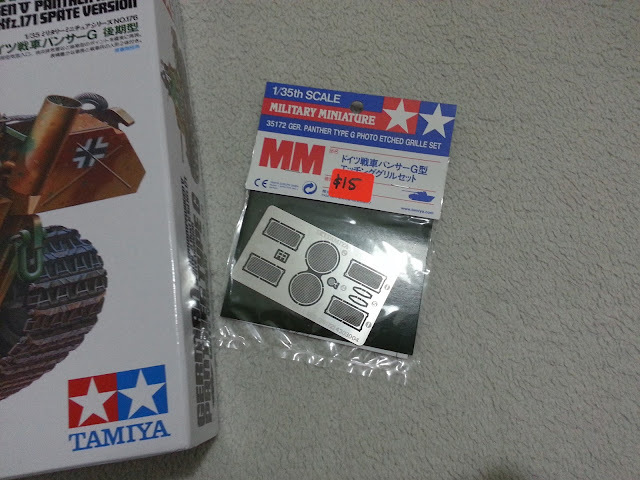 I knew I wanted to build a Tamiya kit, because Tamiya are just my favourite kits to build. Perfectly engineered, they go together a dream, and the level of detail is just right. Not too fiddly with insane photoetch (I’m looking at you, Bronco models), but no compromise ending up with an over-simplified toy (ahem, yes, you two, Revell and Italeri). it is a fairly recent kit (the kit was first released in 1995 but this version is a recent update). I didn’t want to have to deal with Zimmerit – partly because I don’t like the way it looks, and partly because it is a pain in the arse to model well. The two figures included in the kit tell an amazing story fresh out of the box. The diorama is begging to be built. So now Tamiya 1/35 scale model Panther Type G (Tamiya code 35176) is mine! Brilliant box art by Tamiya. I also picked up the accompanying photoetched engine grills because they were there and the price was right. The bad news is that I’ve now added this damn fine kit to my stash. My ever-growing stash. How is that bad news? My spare time is so limited, and my output so slow, that I don’t know when I’m going to get time to build all the amazing kits in my stash. Sort of a good problem to have. 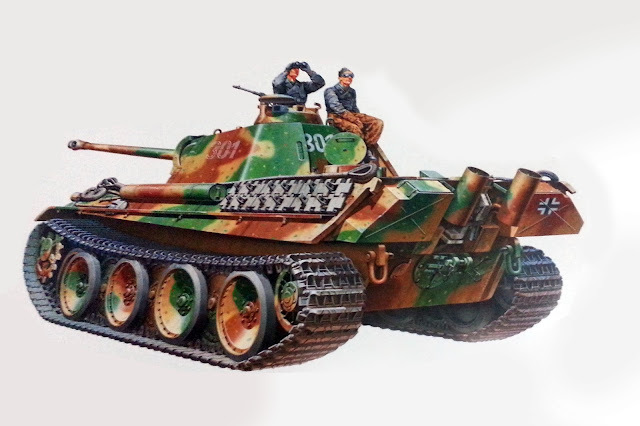 As of today, I want to build this Panther so much, but I have a strict self-imposed policy of not having multiple builds on the go at once, so it will have to wait until the Mustang is completed. (I like to obsess over my current build, and more than one on the go at once dilutes that. Plus if you've seen my videos you know how messy my workbench is - two kits at once, forget it). Ian bought a 1/35 Elefant tank, and it came as a package deal with a set of three wounded German figures. He doesn’t like building figures, so he donated them to me. Sweet, thanks Ian! Not a bad little weekend outing. So yep, that’s my next project sorted. Perhaps this will give me inspiration to finish the Mustang a bit quicker. Good one Dave... Cant beat a wardrobe full of unbuilt kits and as for trying to build two at once is a mountain to climb. Nice kits for good prices. All 3 G versions are nice EARLY, LATE , STEEL WHEEL. Dragon is more than 2x the price and more complicated to build.